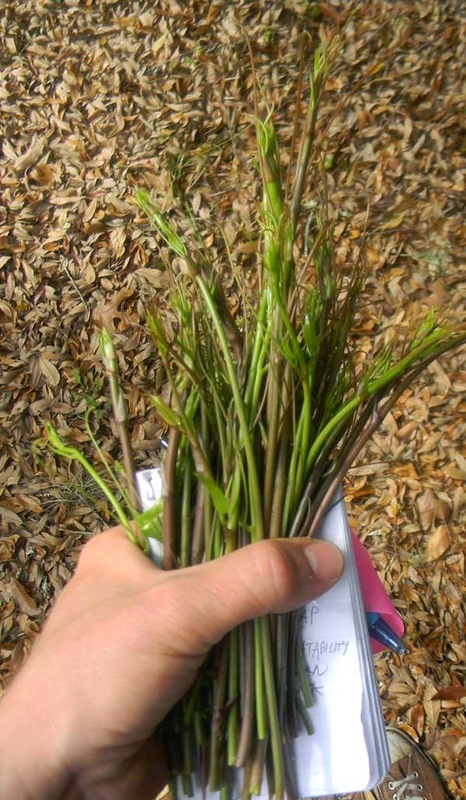 I was out in the woods hunting down wild plants a couple of weeks ago and the smilax shoots were out in full force. Smilax, also known as briers or greenbrier, is a native perennial wild edible that's a first-class culinary treat. They're a relative of asparagus which are much despised by homeowners for their rampant thorny vines. These things are made to tear up legs. This is more than redeemed by the delicious shoots that pop up in spring from the large starchy roots. At this time of year they're everywhere. Some of the shoots are tiny but many rival asparagus in their girth - and flavor. Go hunting and break off the shoots about 6-12" back from the tip. Just snap them where they break easily. Then saute them in butter and garlic with some salt... delicious. On another note - don't forget: today I'll be at the Union Street Farmer's Market in Gainesville from 4-7PM with plenty of interesting plants in tow. We've got blueberries, gingers for tea, perennial vegetables, peach trees and other delights - come find me! I've nibbled on the shoots raw, but didn't know they were good cooked too! I've gotta try this! It's decent raw... but marvelous cooked.